My 15th week in Amy Johnson Crow’s “52 Ancestors in 52 Weeks” family history blogging challenge. I’m no longer a few weeks behind in this series. I am now 6 weeks behind in this series (the challenge just wrapped up week 21). I initially blamed my tardiness on being super busy at home, work, and with my volunteer work. However, the extended lapse can be blamed on the recent diagnosis of some critical health issues that had wiped me out for a while (you can read about that on my food blog). My 15th ancestor is actually a relative, not an ancestor — Revolutionary War hero Major General Nathanael GREENE (1742 – 1786). This post focuses on solving a research puzzle, instead of a biographical profile. There are already more than enough biographies on Nathanael. 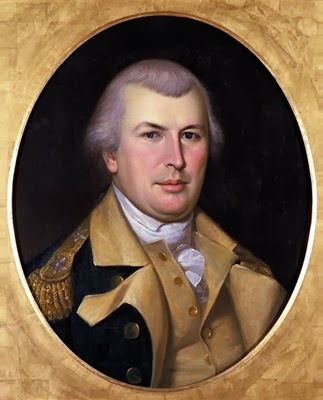 Back in February, I blogged about my efforts to confirm or deny a relation between my husband’s line of the Greene family and Nathanael Greene. The family had always heard they were descended from or related to the hero, but I could not find any connection in research. My previous post discusses the issue I ran into with the family history written by my husband’s 2nd great grandfather, William Henry GREENE (1837 – 1921) in 1908. William Henry identified Major General Nathanael Greene as a cousin. William Henry claims that his great grandfather, Christopher GREENE (1733 – 1820) “was an [?] cousin of Gen. Nathaniel [sic] Greene of Rhode Island.” (W.H. Greene, page 1). The “type” of cousin isn’t clear in William Henry’s handwriting, and a family member who later typed a transcription of this history assigned the role of “first cousin”. William Henry’s writing isn’t clear here where he identifies the type of cousins. This typed transcription mistakenly identifies Christopher Greene and Nathanael Greene as 1st cousins. Nathanael and Christopher were actually 3rd cousins, because they appear to share the same 2nd great grandfather (see: Genealogy Relationship Chart). Even though they are both of the same generation, generation #5 in the Warwick Greene line (see below: Nathanael Green’s Relationship To My Husband), this does not equate to 1st cousins. Cousin terminology gets really confusing in genealogy. I constantly have to refer to a relationship chart to get it right. And for those who do not live in our genealogy-focused world (yes, I know, shocker! ), it gets even more confusing and even less important. People are simply “cousins”. And for most people, if two individuals are from the same generation, it would make sense to call them “first cousins”. This same-generation conclusion is incorrect, though. The degree of “cousinage” depends upon their most recent common ancestor. In the sources I located for our William Henry Greene ancestral line, and for Nathanael Greene’s line, I simply could not find a 1st cousin to Nathanael named Christopher who had children whose names matched those identified by our William Henry. The initial brickwall encountered in this cousin relationship hunt between our Christopher Greene and Nathanael was due to incomplete sources. Our William Henry’s memoir does not identify ancestor’s beyond his great grandfather Christopher. Nor does it provide any biographical information about Christopher to provide clues, except for the names of his descendants. Leaving me no good leads to pursue. My other key source, the Greene Family Genealogy (from the personal papers of General Greene) that I found on Facebook and analyzed in my initial post on this subject, is also incomplete. It does not extend down enough generations in Nathanael’s cousin lines to reach our Christopher. For our line, the closest ancestor identified is Benjamin, son of Samuel, who was the 3rd son of John, eldest son of John “The Surgeon” Greene. Post by Maj. General Nathanael Greene Homestead. Using these two sources, I simply could not connect the dots between our Christopher and Nathanael. Shortly after my first post on this issue, I stumbled upon a key publication while pursuing and perusing other published histories on Major General Nathanael Greene. The Greenes of Rhode Island, with historical records of English ancestry, 1534-1902 (1903) by General George Sears Greene is considered by Warwick Greene historians to be the most authoritative and documented published history on the Warwick Greene line, the Greene line (from Warwick, Rhode Island) from which Nathanael is descended. I was thrilled to find a free copy online and immediately read through the entire long publication. You can see my notes and analysis on Evernote comparing this genealogy against that from Nathanael’s personal papers. Searching for a connection in the G.S. Greene book was an exercise in frustration. Without any “Christopher facts” from our William Greene memoir, it was like hunting for a needle in a haystack in the G.S. Greene history. There are so many Christopher Greenes, William Greenes, and Jonathan Greenes. I didn’t even have the names of Christopher’s parents. It seemed a futile effort. So I slowly and painstakingly started building a separate Warwick Greenes family tree in Ancestry, using all of the names and facts from the G.S. Greene book (!). I wanted to start identifying applicable records (and new relationships and names) for these individuals that might connect to our Greenes. Instantly, record clues started popping up like crazy. This is a very established and heavily documented family. One of the tactics I like to use in situations like this is to find some unique names that I know are from my family lines, and search on those. From our William Henry memoir, I remember him talking about an Aunt Widger, sister to his grandfather William Greene. I had no idea if Widger was a first name, nickname, or surname. Searches in my new separate Warwick Greene tree on Ancestry for “Widger Greene” and “Wigger Greene” did not pan out. 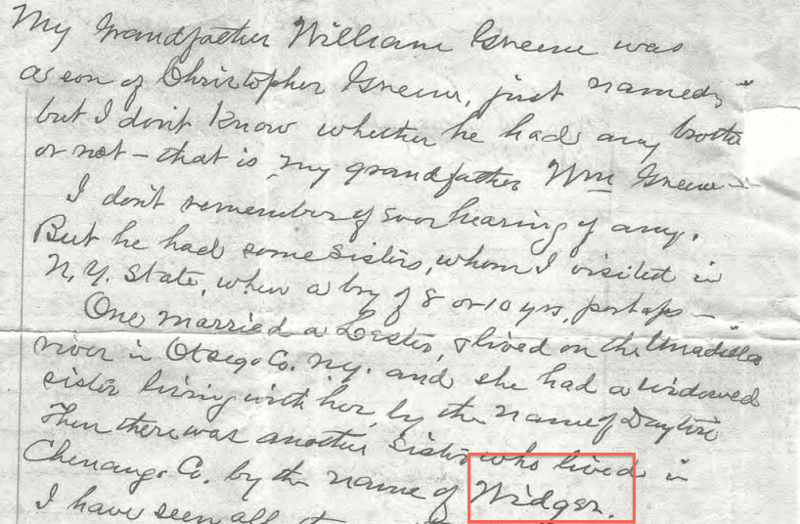 William Henry Greene’s reference to the elusive Aunt Widger, his grandfather William’s sister. Then I remembered William Henry’s reference to an uncle named Leander GREENE. Leander is an unusual name. And male should be easier to track down, since the surname would not change. I used the same approach. Identifying and adding new relationship and names to my Warwick Greene tree, in hopes of finding a Leander. William Henry Greene identifies the sons of his grandfather William Greene. William Henry gives clues about Uncle Leander that I could use in my research. Bingo. I found a Leander Greene in the new Warwick Greenes tree (Nathanael’s line). This Warwick Greene Leander was from Groton, Connecticut, and had parents named William Greene and ? Weaver. The same as our Uncle Leander. His father William Greene had a father named Christopher Greene. The same as our line. This Christopher had a father named Benjamin GREENE, who had a father named Samuel GREENE, who had a father named John GREENE, whose father was John “The Surgeon” GREENE. That personal family history posted by the Gen. Nathanael Greene Homestead on Facebook also had a Benjamin Greene, tracing back through these same names to John The Surgeon. This Benjamin is the last generation from our line documented in the Nathanael Greene papers. The G.S. Greene history also identifies this same Benjamin Greene (person #102 in the G.S. Greene numbering system). This Benjamin had a son named Christopher (person #313), our own Christopher (great grandfather of William Henry). And this Christopher had a son named William (person #752), William Henry’s grandfather. When I cross checked this family against the record hints that kept popping up on Ancestry, I found our William Henry’s elusive Aunt “Widger”. Aunt Widger is Lucy GREENE, daughter of this same Christopher Greene (person #749 in the G.S. Greene book). Lucy married Eli Widger, hence…Aunt Widger. Screenshot from the Kindle version of the G.S. 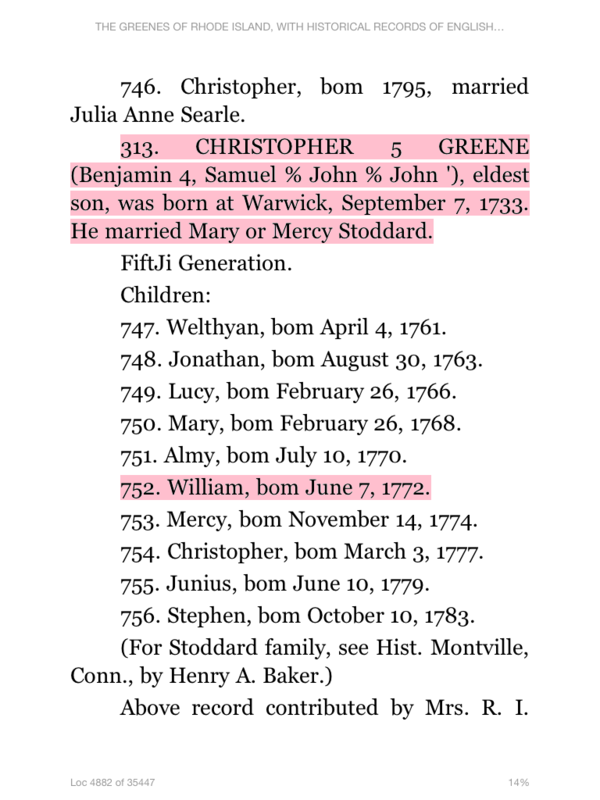 Greene book, showing our Christopher Greene ancestor, his son William Greene, and daughter Lucy (aka “Aunt Widger) Greene. It would appear that Major General Nathanael Greene and my husband are 3rd cousins 7x removed. This makes him a 4th cousin 6x removed of our children. Their common ancestor is the founding member of the Warwick Greenes and the progenitor of the U.S. branch of this family line, John “The Surgeon” Greene (abt 1590 – 1659), who arrived in Massachusetts Bay in June 1635. John is my husband’s 9th great grandfather and Nathanael’s 2nd great grandfather. Although my blog post title claims to have “confirmed” the relationship between my husband’s family and Nathanael Greene, this is still just a very strong hunch. An assumption, based on secondary sources — well regarded secondary sources. I haven’t connected all of these same dots yet with actual evidence. So, it appears my next step are to start obtaining the evidence required for actual proof. Greene, G. S. (1903). The Greenes of Rhode Island with historical records of English ancestry, 1534-1902. New York: [The Knickerbocker press]. Greene, W. H. (1908, May 25). History of the Greene Family. Turner, H. E. (1877). Greenes of Warwick in Colonial History: Read Before the Rhode Island Historical Society, February 27, 1877. Davis & Pitman, steam printers. Thanks. That’s half the fun, right? Hello we are relatives 🙂 Great info! Nathaneal’s ancestor Sir Henry Greene is my 17th great grandfather according to http://www.geni.com. Very cool. I look forward to tracking the line further back. Hello, I am the President of the Gen. Nathanael Greene Homestead, the home Nathanael built in 1770 and hoped to be his home until old age, of course we know that this did not occur. The home is now a museum as well as a National Historic Landmark. We are open 7 months out of the year and conduct a multitude of educational programs. When the Homestead was sold out of the family, the ancient barn was torn down, we are attempting to build a replica on our remaining 11 acres for use as a classroom, and for special events. We are attempting to raise funds for this, any help you can provide by sharing our information is greatly appreciated. Well I know he is my bunch of great grandfather on my mother’s side of the family. I’ll have to download the free book, because although I have many Rhode Island Greenes, (Johns, James’, Benjamins, etc.) I can’t make your detective work fit for me. At least you know what I’ll be doing tonight. My uncle did research back in the ’70s which I don’t have available but the most important thing I heard about it was that Ashbel Greene was our direct ancestor. Ashbel was of the same time as Nathanael, was from New Jersey, as were all the Greenes I knew as “cousins” but not first cousins. My maternal grandmother was Ella Greene Nordt born about 1880 and looking back to my childhood it seemed that the Nordts were the dominant family members – I didn’t see the Greenes much and didn’t really know them. My grandmother died when I was six in 1956. I don’t even know any other Greene names. However, I think Ashbel and Nathanael were related to some degree as cousins. Ashbel held positions in the new government of the United States, mostly in the realm of diplomacy, I believe, and became President of Princeton College, which I think was his last position of employment. Their are biographies of him online, including Wikipedia. I’m not knowledgeable in genealogy, but I once read that the name Greene (or Green) is surprisingly rare, considering that it is a primary color, and that Nathanael’s ancestry was traced back to the first recorded Green[e], a man named John who took the surname Green[e] because it was the color he and his “merry men” wore in Sherwood Forest as camouflage. Robin Hood, I remember reading, was based on one of two or three historical characters, but the most likely one was the John Green[e]. I’m interested in knowing 1) if you (or anyone reading this comment) know the relationship between Ashbel Greene and Nathanael, and 2) your thoughts on the relationship of “Robin Hood” as a possible descendant of Nathanael, which the source I read years ago said was that of direct descendant. I have been told for years that I am related to Nathaniel Greene. My father is Rondorf Vernon Greene III my maiden name is Michelle Marie Greene. I have no idea how to find if this is true as he has only been a name on my birth certificate for 44 years so I don’t have much luck with family trees because I don’t now know his moms name and it just gets stuck – any help? Hi, it’s amazing all the research you have done! I’m related to Audrey Greene who married John Spencer. I just toured the Worwick area recently but didn’t realize he was related to Nathaniel. Thanks for all your research! 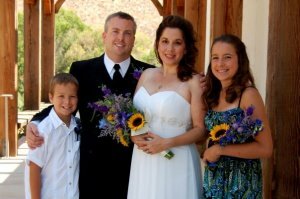 I’m married to a Hispanic man from Mexico-we have a few things in common. I’m also a teacher!